I'm closing this week's series by one of my favorite acquisitions, hosta 'Dragon Lady'. I was visiting a hosta nursery in Cedarburg one Labor Day weekend. I can't spend as much when shopping with my husband, and he happened to be with me this trip. I saw 'Dragon Lady' in one of the display gardens, and was instantly drawn to it since it has huge leaves that are very pointed. Do I need to say it again?? 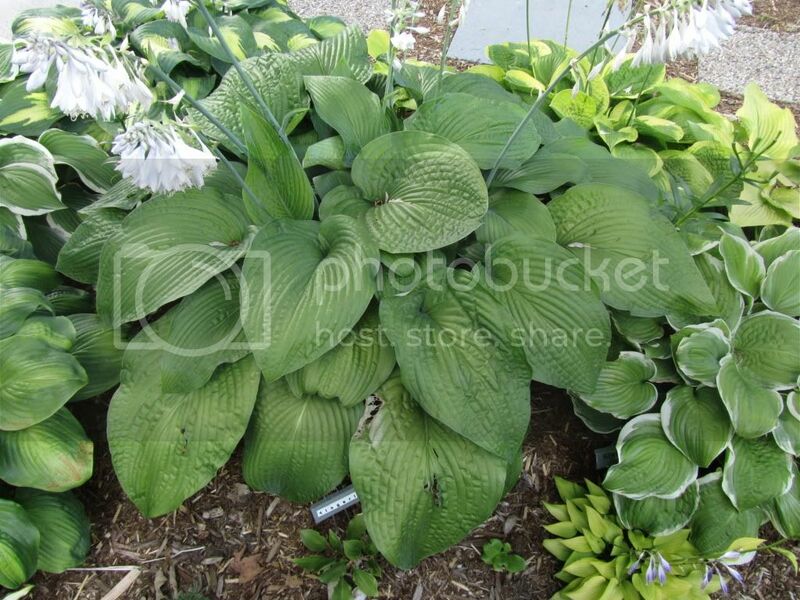 I love huge hostas (which is why I need a bigger yard)! When I saw a division for sale, I thought for sure I would not be leaving with it, since it was more expensive than most hostas I buy. My best friend, Gina, collects any hosta with Dragon in it's name. So I told my husband when we got home Gina would probably want half and we could split the cost. Luckily, he also thought the hosta was pretty cool, and he also knew about Gina and her obsession with Dragon named hostas. When I returned home my friend Gina said she didn't need another large hosta, so I ended up with the whole hosta. It's a decision she now regrets, as every year she begs me to dig up and divide a piece for her. It's so large, it's hard to get a really good photograph of it now. I am newbie in the field of gardening and looking to plant some of the best plants in the garden. This plant looks beautiful and its name adds more charm to its beauty. Thanks for sharing the aricle.